Born on 19th August 1925 at Westcliffe-on-Sea, Essex. Soon afterwards his family moved to Sheffield where he was brought up and attended Kind Edward VII School from 1939-1941. He was a temporary, wartime bank clerk from 1941-1944. He then joined the RAF but was soon transferred to the Royal Navy due to colour-blindness. He was a stores Assistant 1944-1946 with service in Ceylon, India, Burma, Singapore and Hong Kong. He read geology at Sheffield University 1947-1950, followed by a Ph.D on the Ingleton Coalfield 1950-1053. He was appointed Assistant Lecturer at the University of Leicester 1952, and was successively Lecturer, Senior Lecturer and finally Associate Dean for Combined Studies in Science 1986-1988. He retired in 1989 and was made an Honorary Research Fellow. He was a Visiting Professor at the University of Kansas, Lawrence, 1965; Northern Arizona University, Flagstaff 1969, Syracuse University, New York State 1971; Fort Lewis College Colorado, 1972. Also visited University of New South Wales, Sydney, and the University of Adelaide. His research interests were mainly in Carboniferous stratigraphy, moving from the Ingleton Coalfield to the Carboniferous Limestone of the Peak District, in speleology, in Peak District mineral deposits, the history of geological science and the geology of the Isle of Man. The chance discovery of Precambrian fossils in Charnwood Forest led to projects in the Grand Canyon 1965-1988. He has published over 420 papers in these fields. He was elected Hon. 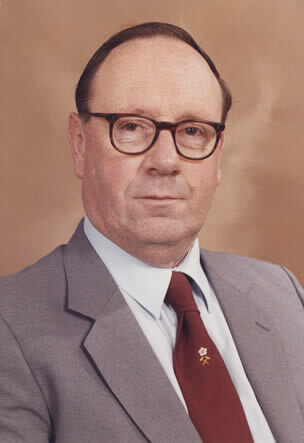 Editor of the Cave Research Group in 1964 (later British Cave Research Association), Hon. Editor of the Peak District Mines Historical Society in 1965. Both posts were held until circa 1990. He was also Chairman or President of both organisations for various periods; President of the East Midlands Geological Society 1982-1085; Hon Editor of the Transactions of the Leicester Literary & Philosophical Society circa 1986-2000, and President 1982-3. He was subsequently made a Life Vice-President. Series Editor of “Limestone and Caves of….” Books, of “The Science of Speleology” and general editor of the Proceedings of the 7th International Congress of Speleology, 1977. Awarded O.B.E. in the Queen’s Birthday Honours List for “Services to Geology and Cave Science” 1997. Awarded “Champion of British Sport” medal by Derbyshire Caving Association in 1998. Awarded a moiety of the Lyell Fund by the Geological Society of London.